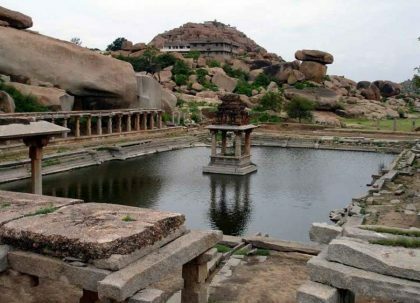 Balakrishna Temple Hampi is situated on the way to Virupaksha temple from Kamalapur, facing East, dedicated to Vaishnava in the form of Balakrishna.This temple was built by the King Sri Krishna deva raya during 1514 A.D to commemorating the conquest of Udayagiri in Orissa. 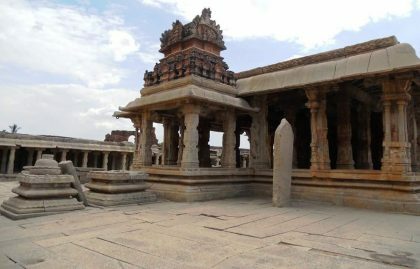 The balakrishna temple is typically in Vijayanagara style and plan, and is one of the earliest temples of Tuluvas, built in 1514 AD, to install the image of Balakrishna, on 16th, February 1515 A.D. 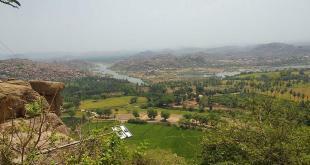 When Krishna deva raya had seized Udayagiri, during the course of his Orissan campaigns. 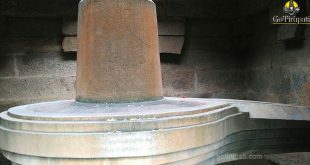 The inscription is kept in the temple records the commemorating of the conquest of Udayagiri Krishnadevaraya and the installation of Balakrishna Image, brought from Udayagiri. The temple consists of a garbhagriha, an anti-chamber, or Sukhanasi, antarala or ardhamantapa, surrounded by Pradakshina pat, a Sabha mantapa or Navaranga, mukhamantapa or Rangamantapa, Amman shrine, all enclosed by high prakara wall with entrance. 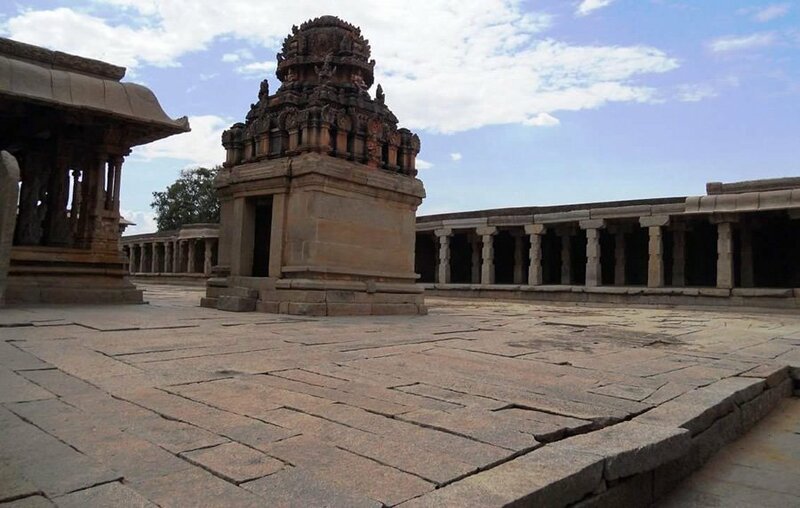 The sabhmantapa or navaranga is square and stands on four central pillars set on an elevated floor in the center and six pilasters set against the walls. The lower and upper square blocks of the pillars are depicted with the sculptures of Hanuman, Garuda, Balakrishna, Kalingamardhana, Dasavatharas of Vishnu, musician, dancers, yali etc. The central ceiling has two rotated squares and top slab is decorated with lion masks, lotus and stick players. The sabha mantap has three entrances, on East, North and South, with mukha mantapa on the north and south sides. The mukha mantapa on the north and south stands on two pillars at the front with flight of steps flanked by Suruli-Yalis which are typical Vijayanagara motifs. 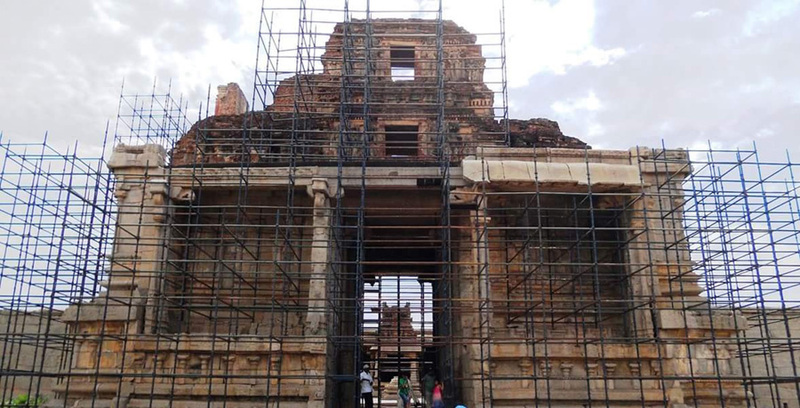 The mukha mantapa or pillared hall is entered through flight of steps on either side of the north and south and the main western entrance on west side. 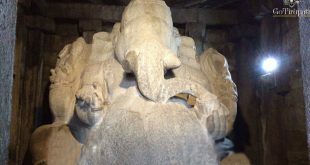 The mukha mantapa stands on thirty-two pillars which are tall, slender and graceful. 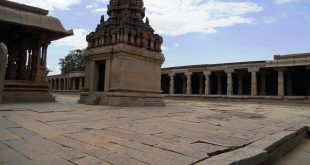 The lower and upper square of the pillars are depicted with Vaishanvite deities, Dasavatharas of Vishnu, dancers, animals, etc. The central ceiling is decorated with lotus and other ceilings are flat and plain. 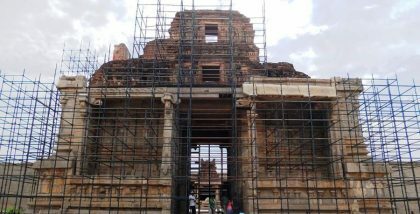 The entire temple complex is surrounded by a high prakara wall and the main entrance gateway is lofty and big in size. The side of the entrance gateway is lofty and big in size. The side of the entrance passage depicts gracefully the river goddesses Ganga and Yamuna, holding scrolls. Above this gateway, the gopura was built of brick and mortar and is massive. How to reach Balakrishna Temple Hampi ? Trains do run from Bangalore to Hosapet junction at regular intervals on a daily basis. Daily trains are available from Tirupati to Hosapet Junction. Travel time is between 8 hours 30 mins – 11 hours 15 mins.